None scheduled in the coming weeks. Previous webinars are on our YouTube channel. Contact Lorre for information. TeleHealth Services will deliver Healthwise’s patient education videos through its patient engagement platform. 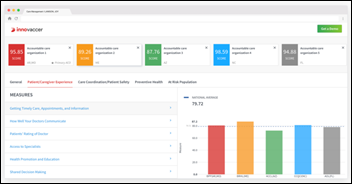 Innovaccer updates its ACO Compare benchmarking tool to give providers the ability to compare up to five ACOs at a time, assess performance trends, and generate more detailed reports. 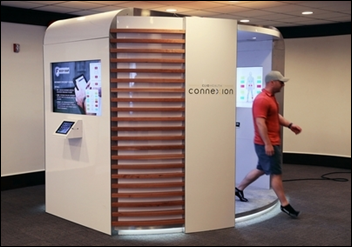 The NBA’s Sacramento Kings will use Connexion Health’s touchless health kiosks to monitor the posture, balance, and health of its players. Head Athletic Trainer Manny Romero believes the full-body scanner will help prevent injuries and lengthen the careers of his players. Signature Medical Group (MO) develops CareMosaic Advanced, a care coordination and analytics platform for physicians participating in the CMS Bundled Payments for Care Improvement initiative. SSI launches analytics software for ASCs that focuses on case management, clinical operations, financial performance, cost analysis, and scheduling. Flint Hills Community Health Center (KS) promotes Renee Hively, RN to CEO. Urgent care software vendor Practice Velocity hires Joshua Porter (EPowerDoc) as VP of business development, and Jaimie Kowalski (UniCarriers Americas) as VP of marketing. CentralReach secures funding from Insight Venture Partners. 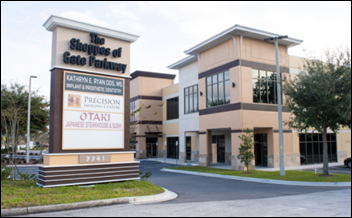 The Pompano Beach, FL-based company got its start in 2012 as an EHR/PM vendor focused on serving applied behavioral analysis clinics. It has since expanded to software for occupational health and speech therapy specialists. EClinicalWorks customer Petaluma Health Center (CA) wins the 2017 HIMSS Davies Award for improving hypertension control among its patients. Healthwise will exhibit at the West ACE User Group Conference February 21-23 in San Diego. 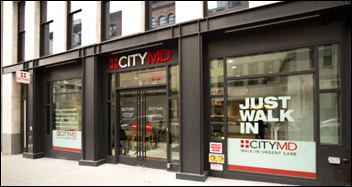 New York City-based urgent care chain CityMD will acquire competitors STAT Health and FirstMed Immediate Medical Care, bringing its total locations to nearly 100. Over half of those are on EClinicalWorks, which CityMD rolled out in 2016. Google tells me STAT Health uses Medent. None scheduled in the coming weeks. Previous webinars are on our YouTube channel. Contact Lorre for information on our webinar services. PerfectServe will integrate its team collaboration platform with QGenda’s physician scheduling software to accurately deliver calls and messages. 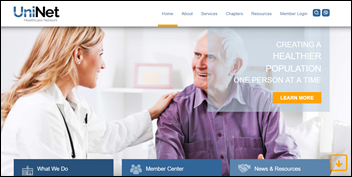 Patient education and branded content company PatientPoint works with MeUCare to develop a multimedia messaging tool for physicians and their patients. Compulink adds text-based patient messaging capabilities to its Dermatology Advantage EHR and PM software. 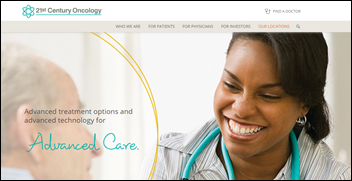 CampDoc.com adds single sign-on and account management technology from Christensen Computer Company to its EHR for camps. 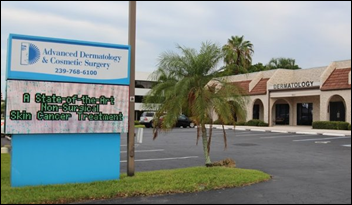 Advanced Dermatology and Cosmetic Surgery (FL) will roll out Modernizing Medicine’s EHR and analytics software across its 180-plus clinics. After a successful pilot, Pottstown Medical Specialists (PA) will utilize Saturn Care’s app-based Chronic Disease Management Program as part of its Chronic Care Management program. Scranton, PA-based care management company Signallamp Health raises an undisclosed amount of Series A financing from Sopris Capital. HIPAA compliance software vendor Compliancy Group announces it now accepts cryptocurrency payments. Fresh off its $3.5 million settlement with OCR, Fresenius Medical Care North America promotes Ahmad Sharif, MD to CMIO. Vermont Information Technology Leaders names former Navy SEAL and state legislator Mike Smith interim president and CEO following the retirement of John Evans. Ann Johnson (Zest Health) will join the American Telemedicine Association as CEO in March. Nextech Systems hires Wyn Partington (NexTraq) as CMO, and promotes Rebecca Sanford to chief people officer. OCR makes it clear that organizations found guilty of HIPAA violations can’t escape their financial penalties by going out of business or declaring bankruptcy. 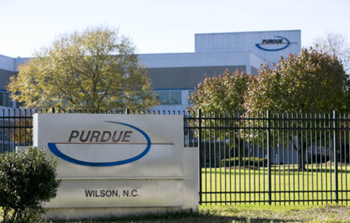 OxyContin manufacturer Purdue Pharma slashes its sales force to 200 and announces it will stop promotional opioid sales visits to physician practices. 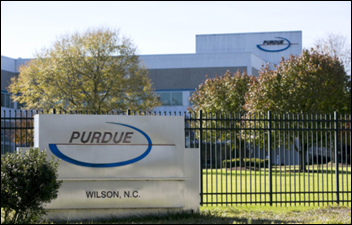 The move comes in the of wake of a federal investigation and 14 state-based lawsuits that claim the company deceptively marketed opioids to physicians. 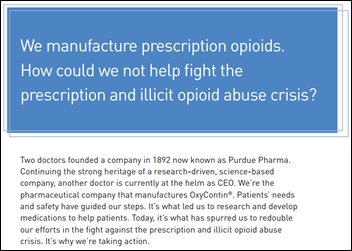 An open letter on the company’s website assures readers it is an advocate of combatting the opioid epidemic through limiting prescriptions and improved utilization of PDMPs. February 13 (Tuesday) 1:00 ET. “Beyond Sliding Scale: Closing the Gap Between Current and Optimal Glycemic Management Practices.” Sponsor: Monarch Medical Technologies. Presenter: Laurel Fuqua, BSN, MSN, EVP/chief clinical officer, Monarch Medical Technologies. The glycemic management practices of many hospitals and physician staff differ from what is overwhelmingly recommended by experts and relevant specialty societies. As a result, they are missing an opportunity to improve the quality, safety, and cost of care for their patients with diabetes and hyperglycemia, which commonly represent more than 25 percent of their inpatient population. Hospitals that transition from sliding-scale insulin regimens to consistent use of basal / bolus / correction protocols are seeing reductions in hyperglycemia, hypoglycemia, and costs. Making this shift more effective and efficient is the use of computerized insulin-dosing algorithms that can support dedicated staff using a systematic approach. February 14 (Wednesday) 2:00 ET. “Time is Money: Aurora Health’s Journey of Implementing and Advancing Cost Accounting.” Sponsor: Strata Decision Technology. Presenter: Patrick Nolan, VP of finance, Aurora Health Care. Aurora Health Care’s implementation of Strata’s Decision Support module involved not only building an improved cost accounting model, but improving the process to engage a cross-functional team in cost development. It now has accurate, consistent cost data to support decision-making. Aurora’s next phase will be to use actual procedure and visit times to allocate costs. This presentation will provide a detailed view into both the implementation and future direction of the Strata Decision Support program within Aurora. Shenandoah Community Health (WV) names Mike Hassing (Community Link Consulting) CEO. 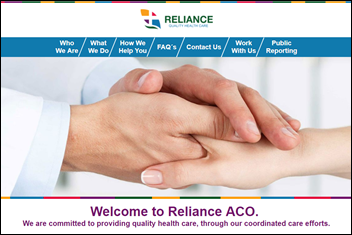 Detroit-based Reliance ACO selects cloud-based population health management technology from The Garage. Banyan integrates automated reputation management technology from BirdEye into its marketing services for providers. 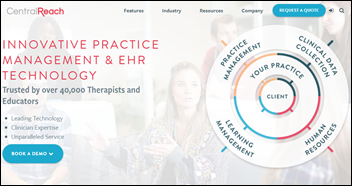 LW Consulting adds Practice360’s registry for MIPS reporting to its line of services. Practice management company Continuum Health offers RCM software and services from Gebbs Healthcare Solutions. Precision Imaging Centers (FL) selects RadNet’s ERAD technology including an RIS, patient and physician portals, and communications capabilities. Outcome Health will offer up CardioSmart educational content for patients from the American College of Cardiology through its proprietary digital devices in physician practices. President Trump signs into law a funding bill that includes the CHRONIC Care Act, which expands telemedicine access for ACOs and Medicare Advantage plans, and allows for reimbursement of telestroke care and home dialysis treatment. Texas-based Cohen Veterans Network rolls out mental telehealth services to post-9/11 veterans. The local paper profiles the launch of two telemedicine companies by PCP Tony Ruffa, DO. Ruffa launched EUrgicare and Psychxpress after working with Gannon University’s Small Business Development Center, which helped him develop the websites and identify and reach target markets. He hopes to soon offer telemedicine services to local employers for $10 a month per employee. 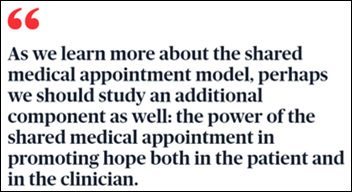 This article highlights shared medical appointments and the impact they are having on primary care for diabetic patients in rural and underserved areas. What stands out is the group support these programs offer, particularly for patients who lack social support systems so vital to improving and maintaining their health. California Insurance Commissioner Dave Jones will investigate Aetna’s claims review process after it comes to light that the payer’s employed physicians don’t typically review patient medical records when deciding whether or not to approve care. The records review process came to light during the deposition of Jay Ken Iinuma, MD a former Aetna medical director called to share his experience as part of a lawsuit brought by a former Aetna member suing over denied coverage. EClinicalWorks will exhibit at the 2018 AAD Annual Meeting February 16-20 in San Diego. Healthwise exhibits at the 2018 South ACE User Group Conference in Raleigh, NC. Athenahealth continues its leadership restructuring with the appointment of Jeff Immelt as chairman – a position previously held by CEO Jonathan Bush. 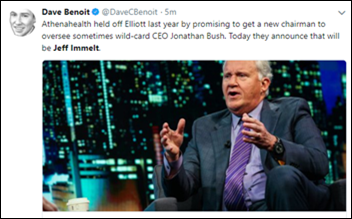 Immelt, who helmed GE as chairman and CEO for 16 years, plans to purchase $1 million in Athenahealth stock, and invest in the company. Not one to rest on his laurels, Immelt has also joined venture capital firm New Enterprise Associates as a venture partner. Former 21st Century Oncology patients vote to continue with their lawsuit over a 2015 data breach of over 2 million health records. The status of the lawsuit was in question pending the outcome of 21st Century Oncology’s bankruptcy proceedings. Those proceedings have concluded, leaving the company with a new management team and its $1.1 billion debt reduced by half. Patients involved in the lawsuit, which may become a class-action, may be entitled to nearly $22 million in damages. CDI company Enjoin promotes James Fee, MD to CEO. Caresyntax hires Paul Summerside, MD (Summerleigh Associates) as CMO. UniNet Healthcare Network selects Innovaccer’s InData data aggregation tool to improve care coordination efforts for patients in Nebraska and Iowa. VitalHub works with blockchain experts at the Hyperledger Foundation to develop the new WellLinc EHR for mental health providers. Community Care of North Carolina will implement VirtualHealth’s population health management technology to better manage care for Medicaid and Medicare patients across 1,800 practices. ONC and CMS will hold a listening and feedback session on reducing provider burdens related to EHRs February 22. EWellness will put its Phzio PT technology on the blockchain in August. The announcement mentions that patients will be able to digitally confirm the completion of sessions, thus hopefully reducing patient fraud. Recording electronic notes in patient records. Maintaining a current problem list with active diagnosis. Performing medication reconciliation when receiving a patient from another setting or care provider. Using CPOE for new or renewal medication orders. The authors conclude that, “Roughly one-third of MU criteria were perceived as useful in less than 50 percent of patient encounters, which means that time is taken away from typical patients for these non-value-added tasks (i.e. system waste) that must be performed for compliance. Hence the policy becomes a burden on the quality of care that physician can provide to their patients. 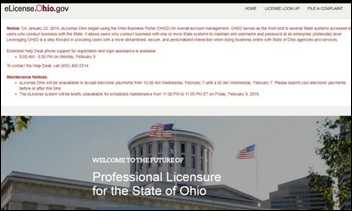 In total, these findings provide insight into CMS’ comment that MU has ‘lost the hearts and minds of the physicians.’"
In Ohio, state medical board officials extend the medical licensing renewal deadline for 1,100 providers to February 14 after the bumpy mid-January addition of government administrative software to the state’s ELicense system. The new OH/ID system will be turned off to address several kinks that have left 400 providers unable to renew. AdvancedMD will exhibit at the Association of Dermatology Administrators & Managers February 12-14 in San Diego. 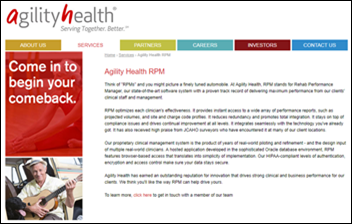 Alliance Physical Therapy Management will acquire Agility Health’s US operations for $45 million. 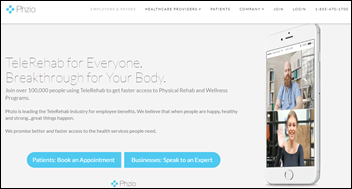 Agility manages 84 outpatient physical rehabilitation clinics in 16 states, and develops related PM software. The Canadian arm of its similarly named parent company operates 12 podiatry clinics and manufactures orthotics and prosthetics. 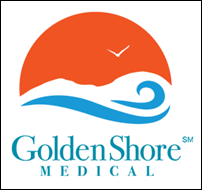 Golden Shore Medical Group (CA) enlists Apollo Medical Holdings subsidiary Network Medical Management to manage 100,000 health plan members across 17 clinics using AMH’s population health management technology. 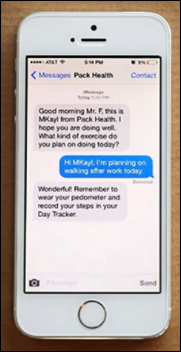 Health Endeavors develops the One Touch Health Smart Record app, giving patients the ability to send and receive data – including care prompts – from their provider’s EHR via Direct messaging. Sunwave adds a real-time communication tool to its software for substance abuse treatment providers. Pediatrics-focused health IT company Office Practicum secures an undisclosed amount of funding from Pamlico Capital. Digital health coaching company Pack Health will invest $2.9 million in a company expansion that will include renovating new office space in downtown Birmingham, AL and hiring another 175 employees over the next four years. Oncology EHR vendor Elekta becomes a reseller of Equicare Health’s Active Patient Portal and cancer care coordination technology. The reseller agreement comes on the heels of Elekta’s agreement with IBM to offer Watson for Oncology as a complementary clinical decision support tool. 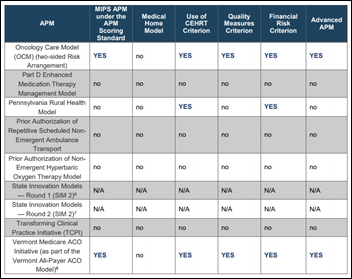 CMS creates a table of its Alternative Payments Models based on their MIPS or Advanced designations. Ten of the 39 qualify as both. The American Heart Association/American Stroke Association and Nordic help University of Colorado Health and Saint Francis Hospital – both Epic sites – optimize quality measure reporting for stroke patients using the ASA’s Get with Guidelines-Stroke program. Medicomp Systems will host Medicomp U 2018 May 21-24 in Reston, VA.
Nordic will exhibit at the HIMSS Wisconsin Dairyland Event February 8 in Madison, WI.